Where I will post upcoming event's, news, Release information and excerpts for all upcoming books. As the day goes on and more sales links for the Paperback, go up we will be adding them. The link above is the universal link for the Amazon Ebook. So you can now find them on the amazon for your country and pay in your own currency. Get your copy now. Dark Roses Entertainment is Happy to announce this weekends release of Broken. The second In between Novella of the Dark Dreams series by Shawn Hilton and Toni Force. Broken again takes you back into the world of the Michigan Shapers, and wets the appetite that some of you have built up for more. Like with Mine it followers a secondary character of the series to give you a chance to learn more about them, and the world as a whole. In this case Savannah Grey Aka. Sarah. Akala's younger sister thought dead at his hands for so long. So once again, welcome to the Michigan Shapers. Company wise our C.O.O will be offline for the next few weeks as he moves into his new apartment and tries to get his life rebuilt after as rough year. We all wish him a speedy return. When he does return he will be relaunching the company website with some massive changes and updates. The company is also going into a direction that will make it easier to bring you more literary entertainment. In a number of fields and from more great new authors. Since the main website will be down, you be getting your news and updates from Facebook athttps://www.facebook.com/DarkRosesEntertainment our Twitter at @DarkrosesENT, Shawn and Toni's Pinterest as well as both of their Goodreads profiles which you can find here. In the coming weeks there will be alot mroe announcements leading up to some major and really good changes in the company setup and structure. We look forward to entertaining you completely. Another 5 star review for Fire and Ice. Yet another 5 star rating and review for Fire and Ice. Vanessa Broken comes out the end of the month from that series, and thank you from the bottom of my heart. On sale this week at the special price of .99 cents get your copy now. Set during the events of Fire and Ice. The friend zone, the one place that every man and woman is terrified of being placed. Sometimes in the games of heart and love, it is the place you end up no matter how hard you try to stay out of it. Once your there, it takes a roll of the dice that no one expected to show the one who put you in the friend zone that you don't belong there. Nikki and Mike have been friends for over two years. The tension has always been present between them, but somehow the wall of friend zone was built. The question is, just how strong is that wall. Mine for sale to help MS research. 0.50 Cent's from each Paperback and 1.00 from each Ebook sold will go to the The Jordan Hilton MS Fund. Fire and Ice the Ebook version is currently on Sale for 4.99. This is for the Ebook only and it is only a test. If it sells best at this price we will leave it at this price. If not we will reevaluate later. But if you wanted to get the Ebook and the price was to high for you, this is your chance. When will book 2 of Dark Dreams be out? I was asked the other day when Book 2 would be release from the Dark Dreams series and the Answer is not until after January at least. We have several Novellas, and at least two other books that will be coming out before it is ready for release. Fire and Ice has been up for sale for over a month and a half now, and despite my claims and personal belief that I am a God. I have not as of yet mastered the art of typing a book a day. But it is moving along. But much like Tv and movies, it will have to wait it's turn. The reasons for that are two fold, first like allot of Authors as Toni and I start to write on something, it depends which story is jumping up and down on our brains, and screaming in our ears that it needs to be told. Second and this is the reason that even I hate has to be a reason. We are trying to build a career which attempting to make enough money from entertaining you, just to live off of. This means we have to write and get ready for sale things that will attract you and more people into wanting to read it. Then there is the formatting, there is the editing, the proof reading. So as time rolls on we are getting several things into the various stages. Now while Fire and Ice has sold well, we are not Stephen King, or J.K Rowling we do not make enough off the sales of just one book to say, Yep i can pay my bills. So we have to keep working on books and novellas and so on, which means that Book 2 is in the line, and the line is moving. Want to help? here is how Go to Goodreads. If you have read and rated the book. Write a review, tell me and Toni what you liked. Do on Amazon where you bought the book. Because we cannot know what you like and what you don't like unless you tell us. Announcing From the Writers of Fire and Ice Shawn Hilton and Toni Force, the Release of Mine A dark Dreams Novella. As an Added bonus 1.00 from each Ebook sale, and 50 cent's from each Paperback book sale will be donated to the National MS Society. If you liked Fire and Ice you will not want to miss Mine. Official Release date is Friday 30th of August but order yours now direct from the publisher, link below. Amendment to Article #13896506543 Also known as the Shaper Fair treatment act. Summary: Written in conjunction with the King of the State of Michigan, and ratified by the Kings and Governors of the 51 States of the Union. Signed into Law by Imperator Vampirica and President of the United States on November the 12th, 2030. This and the law that it amends will be forever known as the Shaper Justice Act. It is to address many problems presented in this day, the inability for JTLR and other Government agencies to police the many factions of Shaper's also called Shape-shifters within the United States. It further more sets guidelines and rules pertaining to but not limited to marriage, land ownership, and voting rights. Body: On this day, it is henceforth ordered that: Shapers will be given the rights to make laws for, to protect and police their own lands, so long as they are privately owned. Shapers who live on state owned lands must abide by the mandates of Article #13896506543, of July 2023. Packs who have obtained and acquired their own legal rights to their lands no longer need the list protection of their state's government to prevent hunting of their kind, but this is limited to the borders of their lands, and may only aid in protecting the lands of others through invitation of the respective Packs and only Packs who own their own lands may invite aid to protect it. Protection of State owned lands and Shapers licensed to live there on, will fall solely under the jurisdiction of JTLR. Furthermore, any member of the races of Human and Vampire who may violate the laws of Pack lands must be turned over to JTLR for punishment. This is to prevent summary execution of other racial members who cannot have, and have not have been informed of the law of the land, in this case ignorance must be a defense. JTLR will then investigate the offender, if they are sure there is no proof of knowledge of the broken laws, then at most, a warning will be issued. Shape-shifter on Shape-shifter violence within Pack owned lands will be the sole jurisdiction of the Pack who owns the land. A Pack may only obtain land ownership rights when A) bought the land outright, and paid a fair amount for the lands current market value, B) was donated to the Pack, as a gift, in which the gift giver has signed over all rights to the Pack, and the Pack is capable of paying all required taxes, c) Inheritance, and meets all requirements of the inheritance laws. By no other action may a Pack or Shape-shifter be listed as landowners. In the address of Shaper marriage, Shape-shifters may marry with exception of: Shape-Shifters may not marry non infected humans, as there is too much of a risk of the virus spreading through bite or sexual contact. Scientists have proven that the Shaper virus is a communicable disease, and based on the blood test laws of the United States, no infected person may marry a non-infected person. Furthermore, no Shape-shifter may marry or be listed as next of kin for those of Vampire kind, they may only enter into a blood bonding at this time. Blood bonding gives no legal rights to inheritance, this was decided by Imperator Vampirica. Further Notation: A challenge was brought against this law and is awaiting Supreme Court ruling on the classification of the Shaper strain as a Virus, or Viral infection, the basis being the contention that the Shaper strain does not meet the requirements of a disease. These changes are hereby to take effect immediately, and with post haste, from this day forth. JTLR will not be responsible for any action with privately owned Shaper lands listed within their mandate, unless a specific request for aid is made through the King or Governor of the Respective state, at which time the State government or the Shaper Pack leadership will be responsible for all costs incurred by the investigations. Anything not covered with this amendment, yet still covered within law #13896506543, are to be considered valid as written, and will not change under this amended notation. Signed and Ratified into law by the 130th congress of the United States, and the council of the Ageless, approved and instituted by both President of the United States and Imperator Vampirica. The clerk closed the law book in front of him and shook his head as he turned to look at the secretary at her desk, in the cubical just outside his office door. “Shelly, could you make sure that copies are sent each King and Governor please.” Just as she seemed to want to answer him, the phone rang and she was forced to pick it up. “Did they say who?” he asked with a great amount of impatience in his tone. The truth is, he knew they probably hadn't. He hated dealing with Vampires. As had his predecessor and the one before him, and the one before him, all the way back to the end of the Vampiric war, that had begun just after World War Two, and Vampires had come fully into the open in the United States of America in the early 1990's. Now, he did get along with a few, but a politician was a politician, rather he chooses to eat steak or drink blood and there was a reason why jokes such as 'why do you bury a politician 100 feet down... because deep down they are good people.' still made some laugh. In fact, at times he was forced to agree, although he would never say things like 'Vampires and Humans proving daily that politics has not changed in a 1000 years.' out loud. He was angry, at times, in his job. Sometimes he hated it with a passion, but never enough to risk his life in the process. So, when he picked up the phone, he put a pretend smile into his voice as he spoke. “Hello Councilman.” then he froze for a second as he heard the name, he never got many calls from the council members of Michigan. “Yes sire, I just checked the notations today, it went into official act this morning.” He paused to clear his throat, he would have reached for the water on his desk, but he was sure that would be rude. “Wait, I am sorry sire, you need to check what? Yes sire, one second.” He stopped and opened the book in front of him once again and ran his finger down the pages to the marked one he had just been putting the Supreme Court note in. When it was once again open, he began reading the different sections of the main law that was the Shaper Justice Act. “Ah yes, here it is, sire. In section A, 2-1 any Pack that cannot police its own lands, and has a great spike in crime rates, or shows an inability to protect its people may have their rights of self policing and protection stripped by the council and senate of their state.” He again paused as he listened. “That is not my place to say sire, but no I see no time limit on how long they must prove it.” He finally could not resist any longer and grabbed the glass to take a drink from it. “You're welcome Sire. My secretary is sending copies to all the offices today. You should have it in the morning. Thank you sire.” When he hung up the phone, he made sure to make note in his log of when this call had come in, but he was not stupid enough to list a name with it. Vampires did not like having their names on things that could come back to them, and you never quite knew exactly what could come back to them. However, he had to guess that a Vampire calling about a law going into effect today and the specific information he wanted, as to what the law said about taking away the rights of Shapers who prove they cannot police their own lands. He could guess that some Pack of beasts, somewhere, was going to be hating their lives and relatively soon. A debut novel that will pull at your heart. A new romance that will sink it's teeth in you. In the first novel of the Dark Dreams series, Fire and Ice, you meet Scott and Armida, two people who feel real in their not so fantastic preternatural lives. Scott: 20 years ago he was sure that he had found the perfect love that everyone, man or women, in the world looks for, then it slipped through his fingers as she ran on very cold feet. It has made him angry. It has made him cold in his rage. Armida: She had found the perfect man. He was everything she ever wanted or needed, no matter that her family did not like him as much as she had hoped. Then he changed and became so different that she was scared of losing everything she was to his very dominant heart. No matter how much heat she brought to the table, the fear of the dark and unknown would not leave her. 20 years have passed and the world has moved on, they had moved on. But sometimes the world knows you have to look back and understand the past, before the future can be lived. Fire and Ice, this new Supernatural Romance, is set in a world that is changing, with political moves that seek to make slaves of the very independent and strong Shapeshifters, A world divided by the need for dominance and control. Based in the beautiful landscape of Michigan's Upper Peninsula. Join the people who have already discovered the Michigan Shapeshifters. 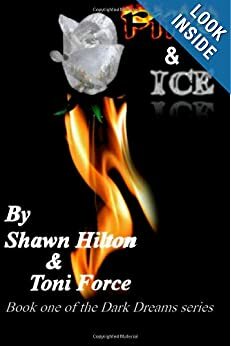 Shawn Hilton and Toni Force bring you a world filled with love, friendship, pain and political backstabbing that will catch the imagination and show you that just because you think someone is different then you, doesn't mean they are. Aimed at young adults to older readers, it has something for everyone. Fire and Ice is already proving its value with sales. This book will have you wanting more and actually asking for it for Christmas. Toni Force, born and raised in Michigan and Shawn Hilton, a retired soldier from the east coast, bring a plethora of life experience into their writing that builds a world that not only feels real and entertaining, but holds you with the fantastic and grabs the imagination. Get your copy of Fire and Ice now available from Amazon Books in both Paperback and Ebook for Kindle. You won't want to miss the romance, you wont want to miss the adventure, and most of all you wont want to miss the pleasure. Shawn Hilton joined the U.S. Army young and began writing as a way to entertain his mind. All his stories have romance in some form or another (even when it is a lunatic vampire who thinks sleeping in his victim's blood is enjoyable.). He likes his characters to have a thread of reality to them. Maybe their actions are fantastic and can stretch the imagination, their personalities, their reasons for their anger or other emotions all have to feel real to him and his readers. He was born in Washington D.C. but was raised all through the states of Maryland and Virgnia. He has lived in Germany and Egypt, and has traveled through Europe and looks forward to more for both research and pleasure. Currently living in Germany where he is close to his three children who always with out fail are close to his heart. He has worked as a soldier, a paramedic, and nurse, as well as in a warehouse as a everything from stock boy, to floor manager, and he tries to bring that feel of harsh reality and life lived into everything he writes. Toni Force has always enjoyed reading a variety of genres as long as the story is good. Romances however, have always been her favorites followed closely by fantasy or paranormal stories. Combine the two elements and she will re-read a story. She hopes the stories she writes will encourage the readers to re-read the story just because they enjoyed the ride the first time. Toni wrote her first book in the third grade, winning a spot in a young authors convention in her area. In later years, one of her poems was published in her community college newspaper. It wasn't until she was pregnant for her youngest child that her husband first encouraged her to write after he read a short story she wrote for her son . Currently, she is living in Michigan with her husband and two children. I have come to a scary realization today. A person whom I recently met, who published a graphic novel script. The author was being unnecessarily abused by reviewers. Now okay, this happens. We all get bad reviews. Which is why I keep asking all the people who have bought and liked the book, if you generally liked it, please be kind enough to write a review and post it, on either GoodReads or Amazon not that it has helped that much. Ratings are great but other readers like to see what you thought, and we have not gotten that many actual reviews for Fire and Ice. But anyway back to my story. So she was being unnecessarily abused by reviewers. What does this mean? It means if a reviewer doesn't like a book, they find every little problem and instead of presenting it in a way that is politely helpful, they go out of their way to be rude and belligerent. Their opinions tend to get lost in the fact that they were rude, so helpful or not they get ignored. This though was not what caught me off guard. What caught me off guard is the fact that one of the rude people, it seems is a published author. I chose not to use his name in this post, because 1) it would bring attention to him and his writing, that due to his rudeness, I have no desire to read, review or submit anyone to his personality. 2) Even though sadly, if he writes with as much dedication as he put into being rude, it could possibly be a good book, but because of the sheer amount of vitriol that he has slung at this other author, I would hate to see how he spoke to anyone who did not like his work. Now even a bad review can be helpful, and some writers look forward to them more than the good reviews, but you have to do it in way that shows you are being helpful. You are trying to show plot problems, editing mistakes, and so on, you can do this by saying what you liked as well, and being rude for the sake of being rude is not acceptable. I simply could not believe that another author would or could talk this way to someone knowing that what you say on the internet can and will reflect on your work. That being said, I know we have people out there who have read Fire and Ice and liked the story, so I would like to take this chance to ask you if you could write a review. Tell others what you thought of it. If you would like to write a review, and do not know where you could post your review that it would be helpful, good or bad, feel free to send me a message here on Facebook, or an Email which most of you should have. We need your help.